Everyone knows now. 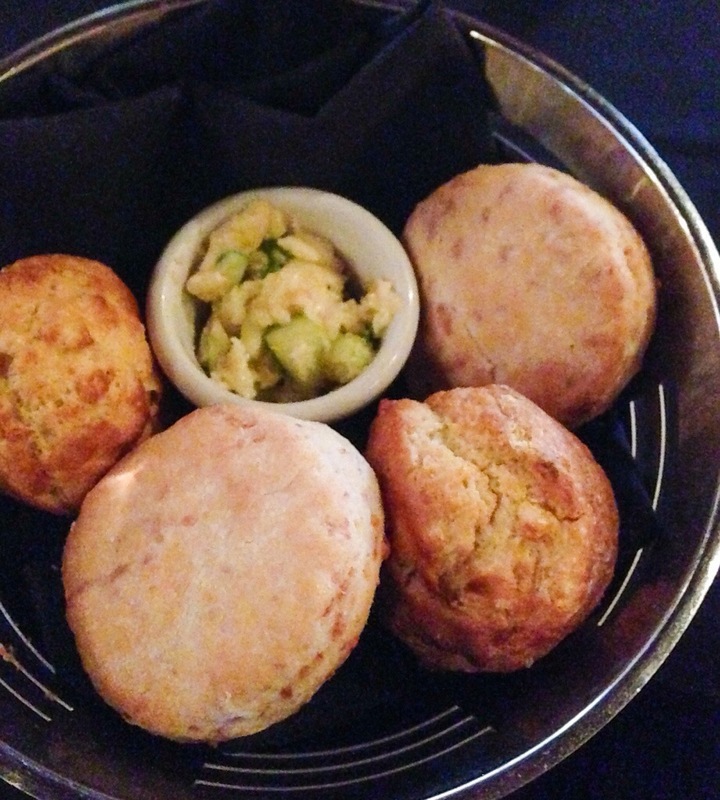 If we are at a restaurant and biscuits are on the menu, then I have to order them. So far, there have been no complaints. Last night, we went to Sunset Grill to celebrate a friend’s birthday. Thanks to some connections, we were able to get a table (it is Vanderbilt’s graduation weekend) and a welcome visit from the owner Randy Rayburn. 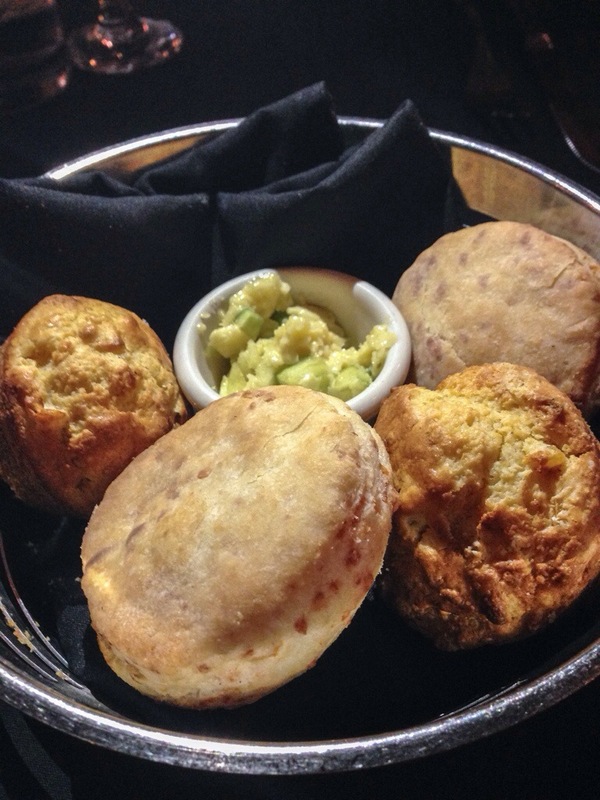 The seasonal menu had cheddar biscuits and corn muffins with sorghum apple butter. We got a couple of orders and shared them around the table before our meal, which was delicious, by the way. Quite wonderful, really. Just thick enough, with a lightly crisp top, and fluffy interior. A bit of salt and cheese to flavor them. What was persnickety about these biscuits? The butter, interestingly enough, was the real surprise here. When the menu said apple butter, I was thinking of thick, spiced, cooked down apple butter. But this was fresh butter, lightly sweetened with sorghum, with chopped up bits of fresh Granny Smith apple in it. Brilliant. It really made the dish. I’m definitely going to have to try this one at home. On July 4th, I went to a Happening. No, that is not some kind of supernatural event . . . well maybe it is. In this case, it was a gathering of artists, friends, and fireworks enthusiasts; a tribute to beloved artist and Vanderbilt Professor Don Evans, who died a few months ago. Don was known for opening his home, gathering people together, and encouraging everyone to “do something.” Make something. Participate in some way. While I never knew Don, I was honored to attend this event and be able to Do Stuff in his honor. I was a little nervous, though. What would this thing be like? First, it turned out to be a reunion of sorts, as many memorials/funerals are – I saw people there that I had not seen in years, which was a wonderful surprise. Beyond that, there were different activities going on all over the property – in the barn, the house, the yard. There was a variety of simultaneous art projects; screenings of Don’s films; the release of a huge whirligig made of an airplane wing and a rocket while we all sang a song called Hard Work; the distribution of ashes; and sharing of stories about Don. 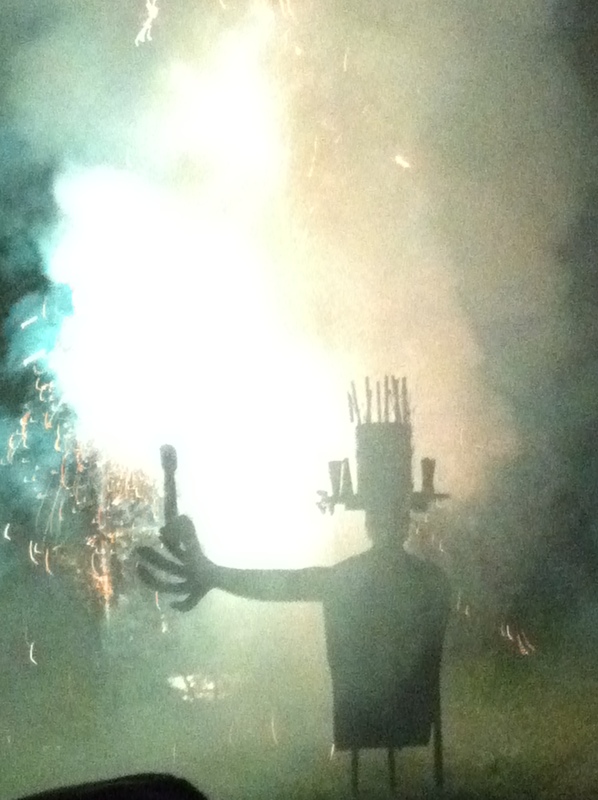 The evening ended with a fireworks show that was truly unlike anything I had ever seen before – a fireworks hat on top of a sculpture and a whole tower of spinning fireworks. Participants had spent many hours constructing it and shielding it from the rain that came and went all day. It was truly a unique celebration of a man’s life. As one might expect, there was lots of food. Everyone brought something, from chips, to hummus, to salad, to an amazing chocolate cake. I know it is shocking, but . . . I brought biscuits. 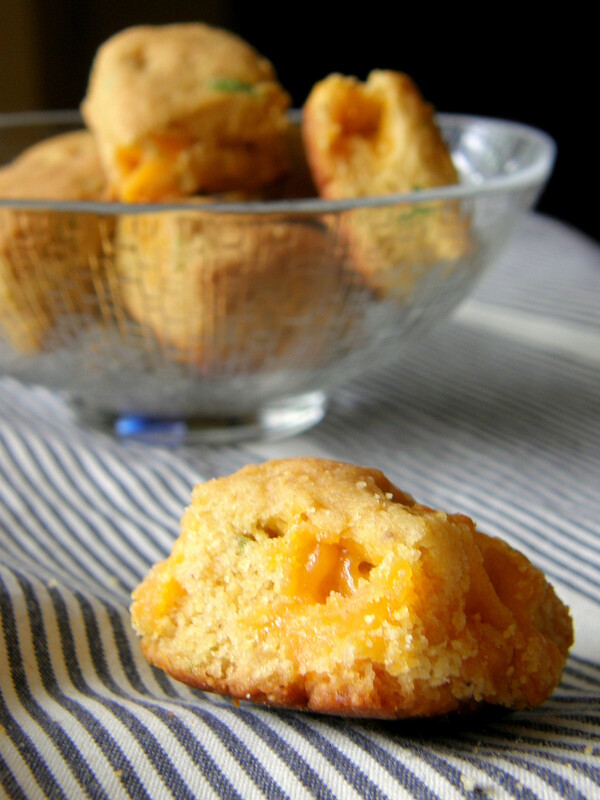 Sweet Honey Jalapeño Cheddar Cornbread Biscuits to be specific. This recipe comes from a blog called Half Baked Harvest. She tells a pretty entertaining story about her first time cooking with jalapenos. A cautionary tale, one might say. I enjoyed reading the post and thought these sounded really different, while still being a biscuit. 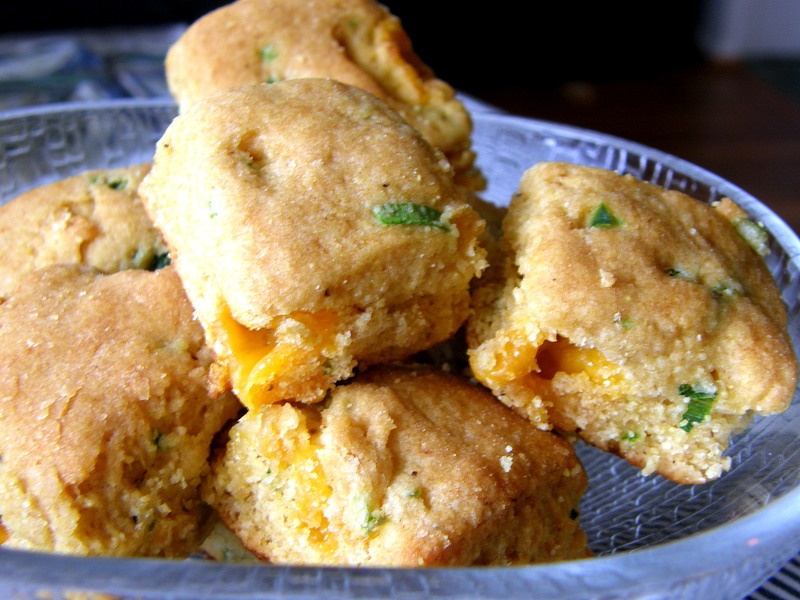 Plus, I knew that the biscuits would have to sit a while – there was no way everyone would get to eat them hot out of the oven, so I wanted something with enough flavor to come through at room temperature. 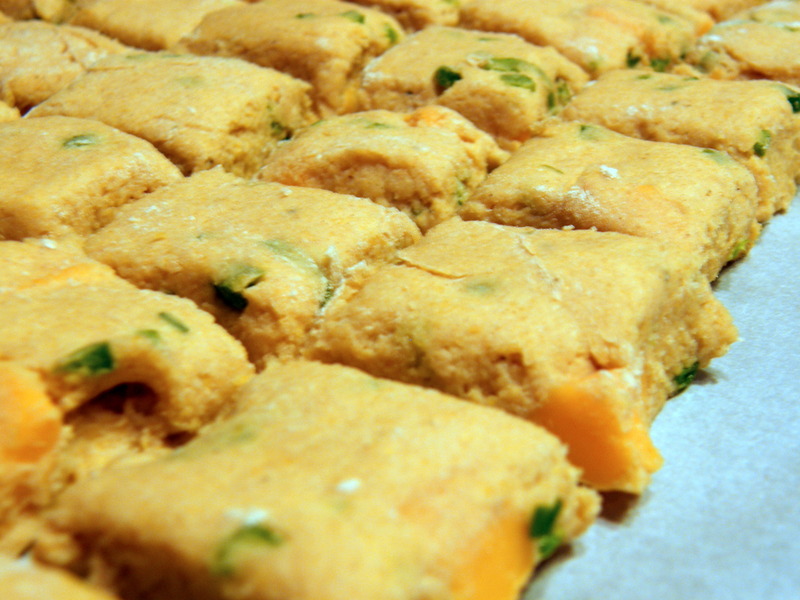 The cheese is cut up into cubes, instead of grated. That seemed like a good idea, but the cubes on the outside of the dough melted and ran out of the biscuit and onto the pan. I’m not worried about my pan, since I used my trusted parchment paper. But it is sad when good cheese is lost in the baking of a biscuit! I followed the recipe closely. The only change I made was to add less chopped jalapeño, which was a mistake. I was afraid they might be too spicy. I found them a bit dry and the flavors were too mild. More jalapenos, cheese, and honey might have all helped. I wanted them to pack more of a punch. But I have to admit that they were all devoured at the Happening, so it might have just been me! I also made them quite small so that there would be plenty to go around. I think they might be better if they were bigger so that there would be more of the soft interior, to contrast with the dry and crumbly exterior. I would also make some kind of filling next time, or serve them with a healthy slather of honey butter. Because everything is better with honey butter! There were not many leftovers, but I toasted the few that were left behind. They got nice and crispy. All of the biscuit baking and tasting and studying over the past few months has been quite enlightening. Lately, I’ve been reflecting on what I’ve learned along the way. There are many sites, articles, cookbooks, and blogs that will teach you the basics of biscuit baking, so I decided to share my slightly less traditional advice. Without further ado, here are my top five favorite, but unexpected, lessons learned [so far]. Frozen, pre-grated butter. First of all, if you grate frozen butter, you really have to do very little to “cut it in” or incorporate it into the dry ingredients. Second, you can pre-grate it and store it in batches. The next time you make biscuits and get out the grater and frozen butter, grate a lot of extra butter, divide it up into 1/4 or 1/2 cup portions (measure before grating for accuracy) and throw it back into the freezer for the next time you bake biscuits. 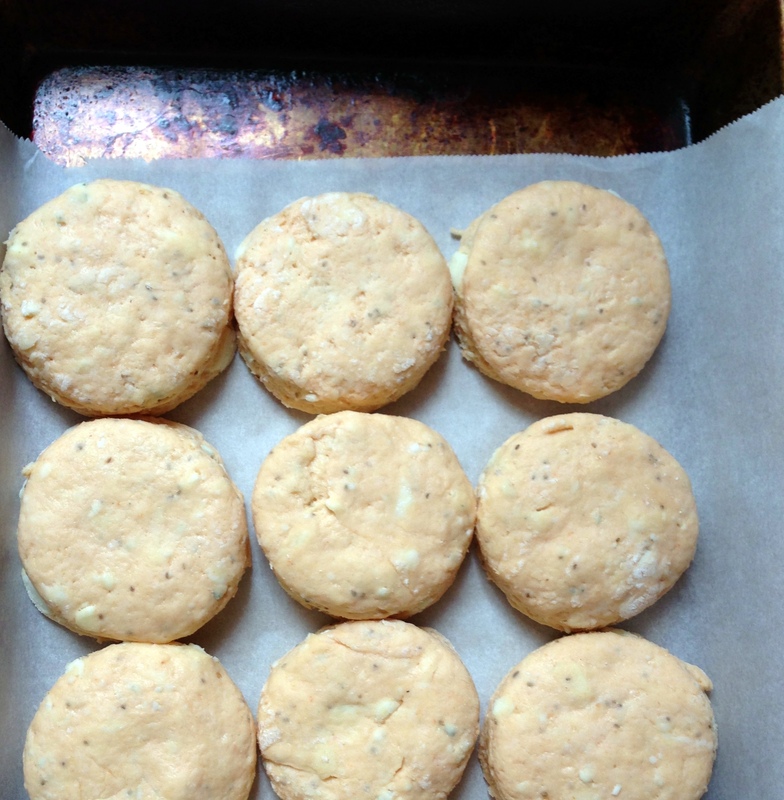 The last time I made biscuits, I used butter that I had pre-grated and it was a revelation. It made the whole process so easy and fast. Rectangles and squares are good. Who said round biscuits are better? Don’t believe them! Think about it. One of the traditional recommendations for biscuit baking is to not overwork the dough. So when you flatten the dough into one big rectangle and use a pastry scraper or knife to cut it into squares or rectangles, there are no leftover scraps. Therefore you are only “rolling” out the dough once. And those weird, last, misshaped biscuits formed from the remaining cutout scraps are all but eliminated. Parchment paper rocks. I have learned to love parchment paper. It is the perfect venue for baking biscuits (or just about anything else) and can usually guarantee that the freshly baked items will release easily. I keep a roll of it on hand at all times now. Remember that wax paper and parchment paper are not the same. Cut where you cook. I think the best advice is often the thing that makes you say, “Well, duh! Of course!” Put the just kneaded dough onto the parchment paper, press it out into a rectangle, and cut it into squares right there. No need to cut out and pick up and move each biscuit. No fancy tools needed. While I have, and love, a pastry cutter, scraper, mat, and a whole assortment of different shapes and sizes of biscuit cutters, you don’t really need all that. You can cut butter or shortening in with your fingers, knead on your countertop, and cut out the biscuits with a knife or old tin can. Biscuits really are low tech. Bonus Item: Freeze raw dough. Everyone knows that the best biscuit is a freshly baked one (regardless of my fondness for toasted leftovers). So cut out all the dough but only bake what you need and freeze the remainder. Then thaw the frozen dough overnight, let it rest at room temp for a few minutes, and bake as directed in your recipe. They may not rise quite as much as the originals, but you still get that great fresh-baked flavor and texture. Do you have any favorite tips or tricks? Please comment and share! Oh, and if you are still a bit mystified by the basics of baking a good biscuits, here are a few references you might find useful. This is a video of Sean Brock, the famed chef/founder of Husk in Charleston and the newly-opened Husk Nashville. I really like how you can see how he works the dough. It looks so soft and light as he is turning it and incorporating the buttermilk. 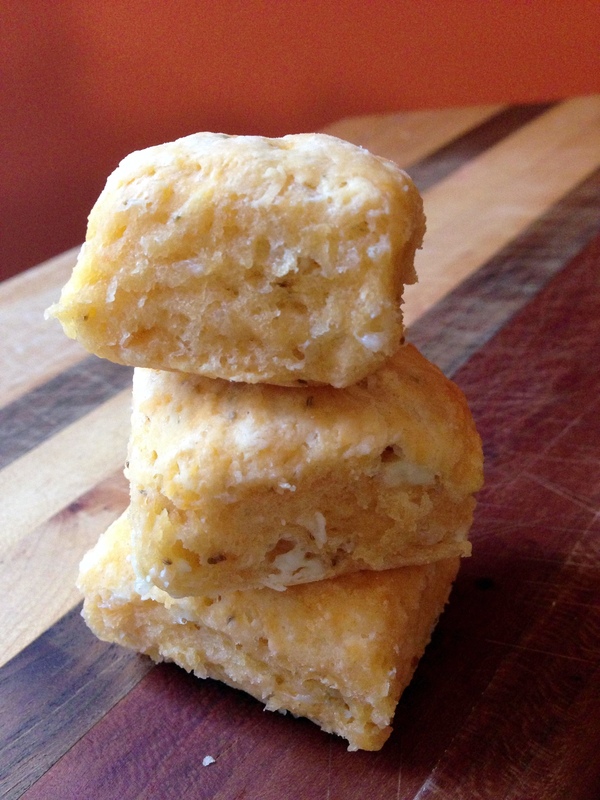 This blogger provides a wonderful list of the traditional suggestions for biscuit making. 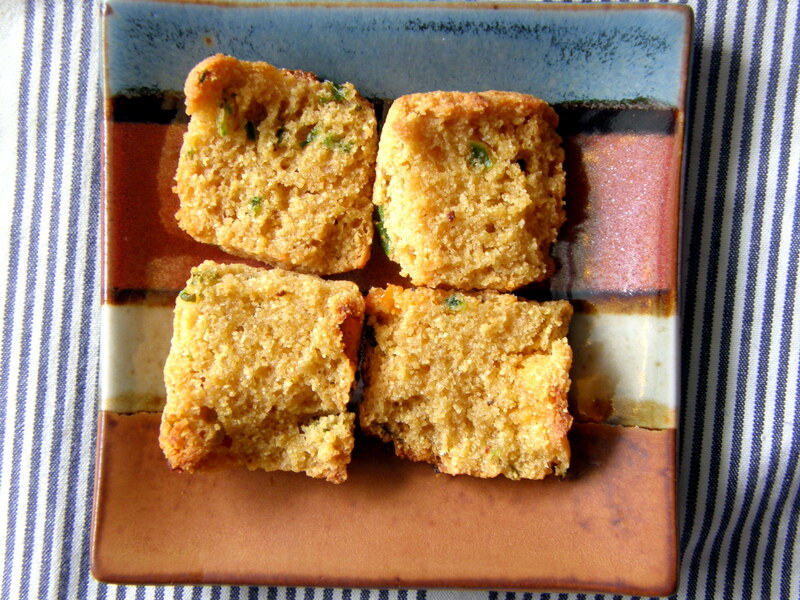 Finally, White Lilly, the biscuits flour of all biscuit flours, provides their own tips here. 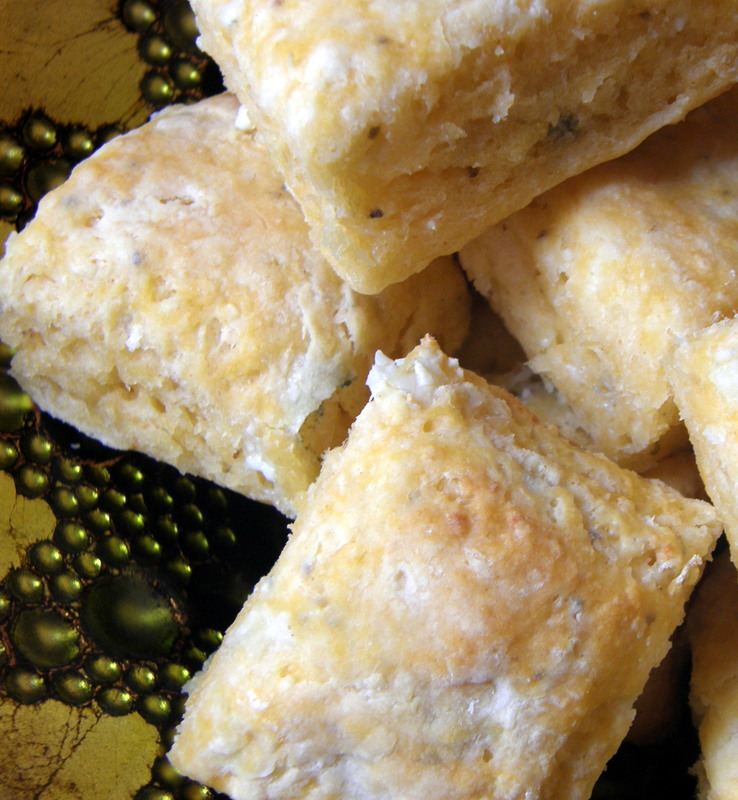 Now go grate some butter, make some biscuits, and share them with someone you love! It seems to come out of nowhere. Perhaps I got a whiff of vinegar or pepper or just chicken. It’s hard to tell. All I know is that I am suddenly craving buffalo chicken wings. Can you relate? I address this in a few different ways. Sometimes I’ll go get wings at Broadway Brewhouse – simple enough. Or I might make a Buffalo Chicken Pizza, or just add some Frank’s hot sauce to roasted chicken. On this day, though, I tried something different. Something new. Something that took the Buffalo Chicken experience to a whole new level. 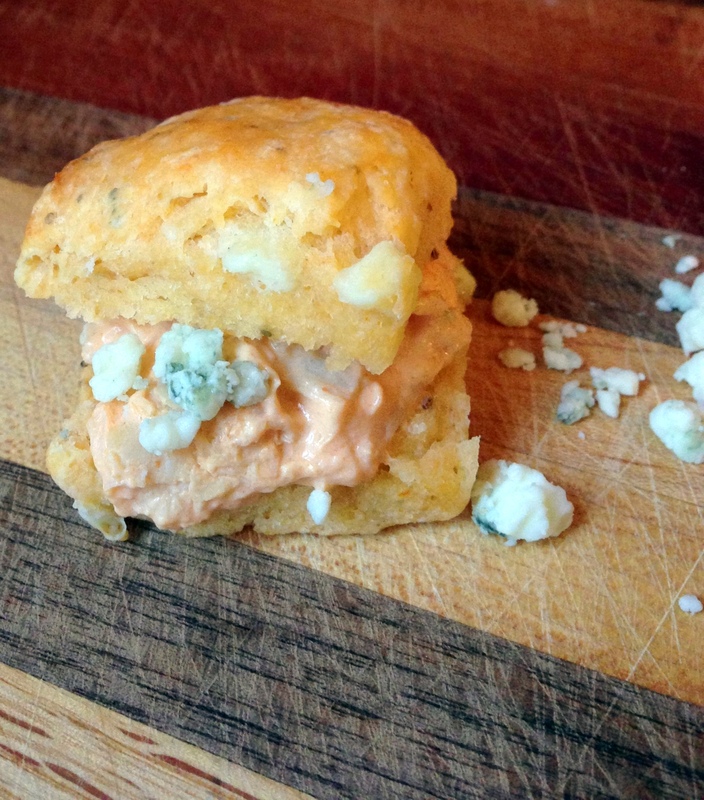 I made Buffalo Blue Cheese Biscuits with Creamy Buffalo Chicken Filling. I made up the biscuit recipe and was really happy that the balance of flavors turned out the way I wanted. The filling is a Hungry Girl recipe for Buffalo Chicken Dip. 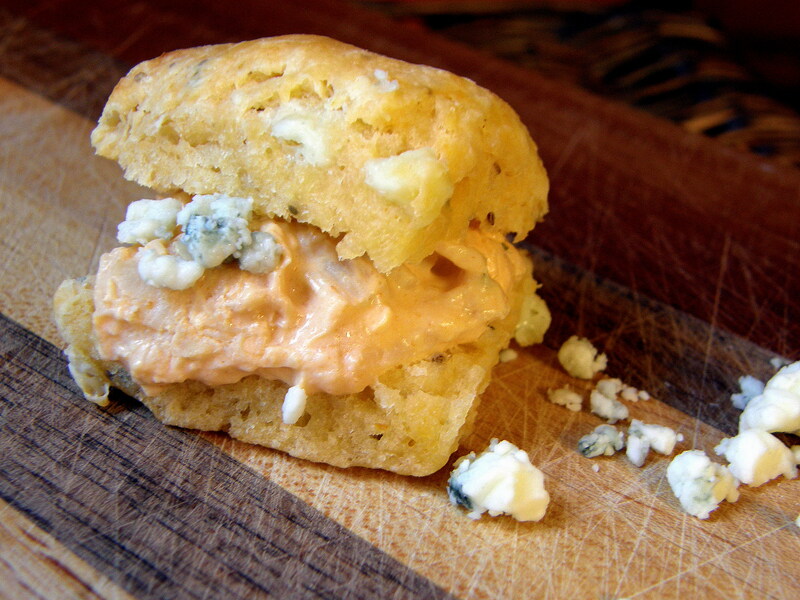 It was perfect on the biscuit, adding a bit more spice and a creaminess that complemented the fluffy, tangy biscuit. 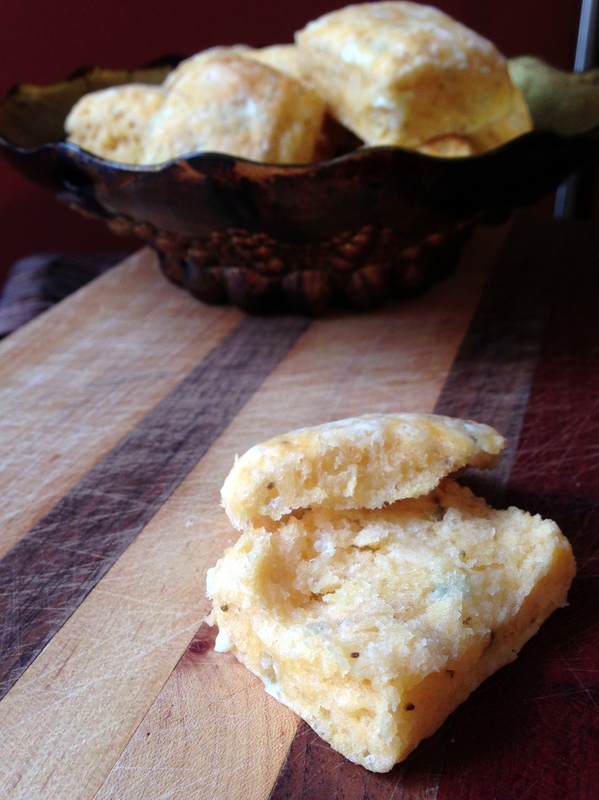 I had seen recipes for blue cheese biscuits and I had seen a recipe for biscuits made with Frank’s Red Hot sauce and parmesan cheese. I was shocked that I could not find a recipe that combined the hot sauce and the blue cheese, so decided to create my own. Honestly, this was one of the simplest recipes I’ve made so far. I already had grated butter waiting in the freezer and I bought blue cheese that was already crumbled. The only tricky thing was that I tried making the dough a bit more wet and then adding flour to even it out. That seemed to work well. The dough stayed soft and I believe the biscuits were more moist as a result. 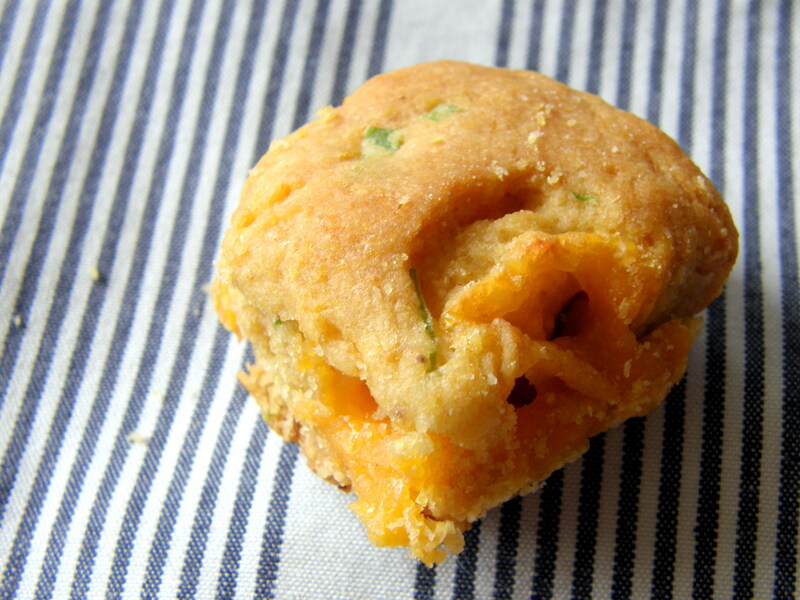 Forgive me for my lack of modesty, but I think I truly captured the Buffalo Chicken Wing experience in a biscuit. The blue cheese and touch of ranch dressing offset the heat of the hot sauce, and the added celery seed even approximated the celery that is usually served with wings. I took these to book club and think the hot filling helped to keep the biscuits tasting fresh. How were the leftovers prepared? There were a few left that had filling already in them, so I microwaved them briefly and that worked well. I had also put several biscuits into the freezer – before baking. I later took them out, thawed them overnight, let them rest at room temperature for a few minutes, then baked them. They did not rise quite as much as the fresh dough, but were still really good. I served those with honey butter and was delighted to find out how well the honey butter complemented the hot sauce and blue cheese. >>>Click here for Buffalo Chicken Filling from Hungry Girl. Add butter to dry ingredients and toss to coat butter pieces with flour. You do not need to “cut in” the butter at this point. Add cheese and toss to coat. Whisk buttermilk, hot sauce, and yogurt in a small bowl until combined. Put cookie sheet in oven and bake for 15 minutes, until tops of biscuits are slightly browned. If you wish, take the biscuits out of the oven a couple of minutes before they are done and brush the tops of the biscuits with butter, then return them to the oven. I used to be a much pickier eater than I am now, especially when it came to vegetables. 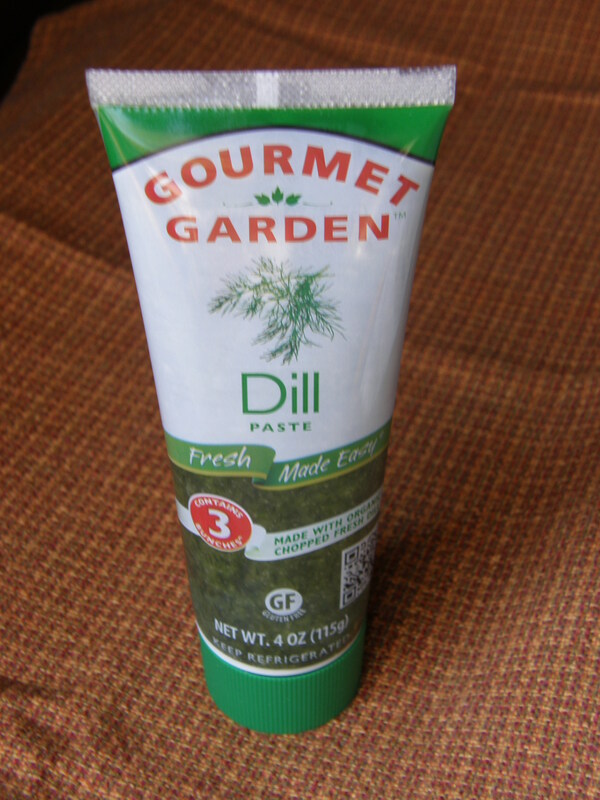 I remember the first time someone offered me pesto pasta. I thought it would be like eating a vegetable. Spinach or something. Was I wrong about that! One bite and I was hooked. I love pesto on pasta and chicken and pizza. So why not biscuits? This one is mine! 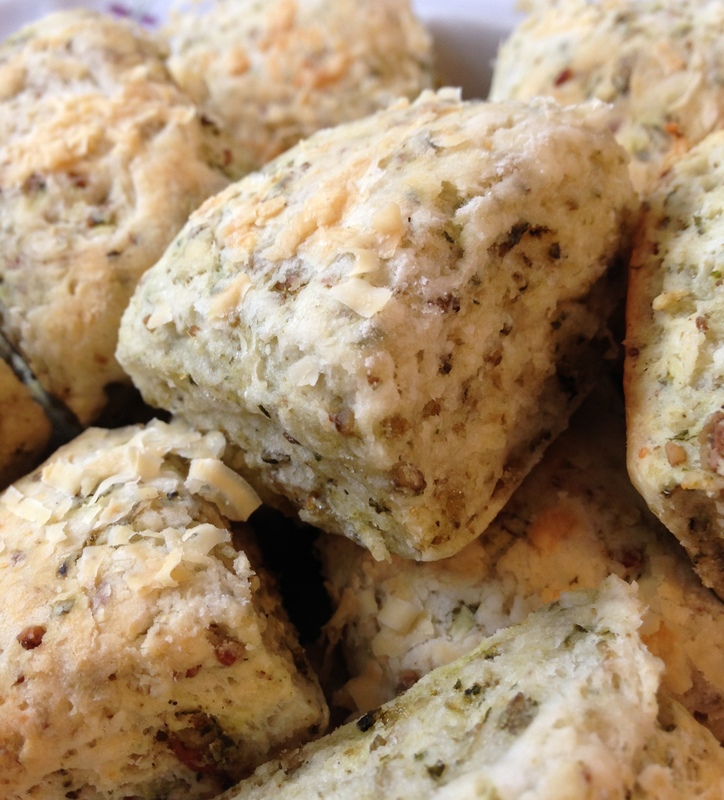 I took the base from the Rich Cheesy Cheddar Herb Biscuits and tweaked it to allow the basil pesto flavor come through. Besides the fact that pesto just rocks, I had some leftover in my refrigerator and thought it would be fun to add it to biscuits. You may have noticed that I’ve made a few biscuits that are this small rectangular shape. I’m sure I will vary it soon enough, but I just love how easy it is to cut up all of the dough at once, while it is on the parchment, and slide the whole thing into the oven. The opposite of persnickety, really. I do like to freeze the shortening. One thing about shortening compared to butter is that it is still workable when frozen. Just colder. You can’t grate it like butter, but you can easily work it into the dough. I tried to work really quickly and not worry about making the little shortening/butter bits too small. They were more flat than round, which I think helped to make the biscuits a little more flaky. Incredibly flavorful. 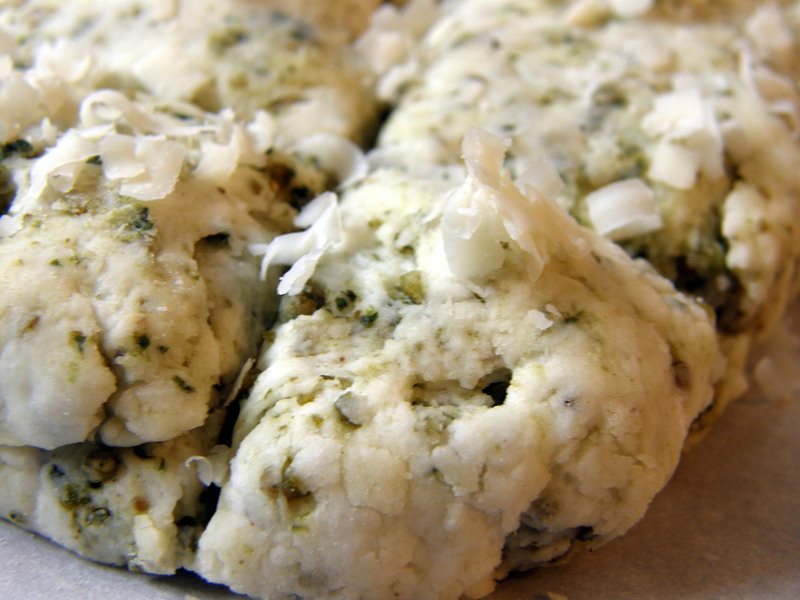 The basil and parmesan were perfectly incorporated into the flaky biscuit that was soft and moist inside. How were the leftover biscuits prepared? >>>Click here for printable recipe. Heat oven to 475 degrees. Cover cookie sheet with parchment paper. Cut shortening into small pieces and add to dry ingredients. Rub between your fingers or cut in using pastry cutter or two knives. Work quickly so that shortening does not get warm. Add pesto, again using your fingers to incorporate but don’t worry about blending perfectly. Make a well in the center and add 3/4 cup buttermilk. Mix quickly with large spoon or hands. Add more buttermilk, if needed, to make dough moist but not too wet. It will be somewhat sticky. Sprinkle flour onto countertop or pastry board. Dump dough out of bowl onto flour. Sprinkle flour onto dough and rub onto hands. 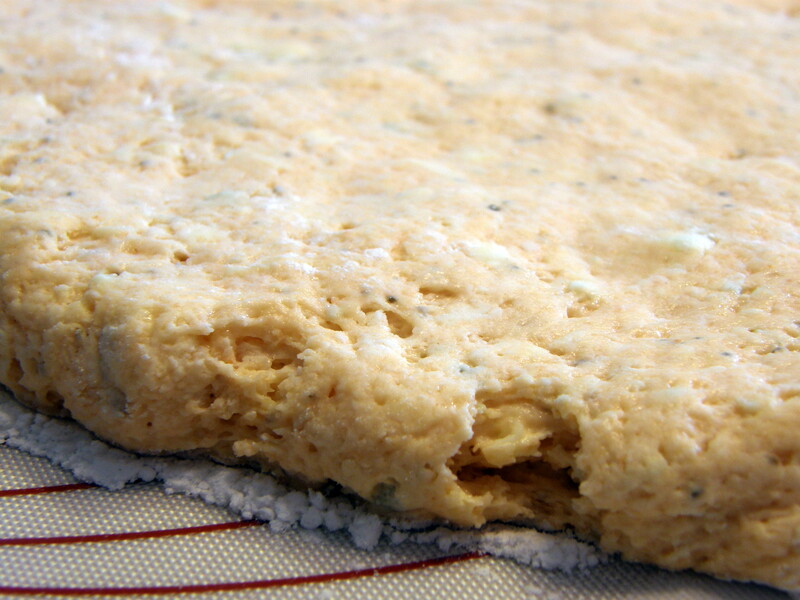 Press dough together quickly and flatten to about 1/2 inch. Fold dough in half. A pastry scraper can be really helpful here to lift up the dough. Flatten dough again to about 1/2-3/4 inch. Transfer dough to parchment paper. Press out again if needed. Make into a rough rectangular shape. 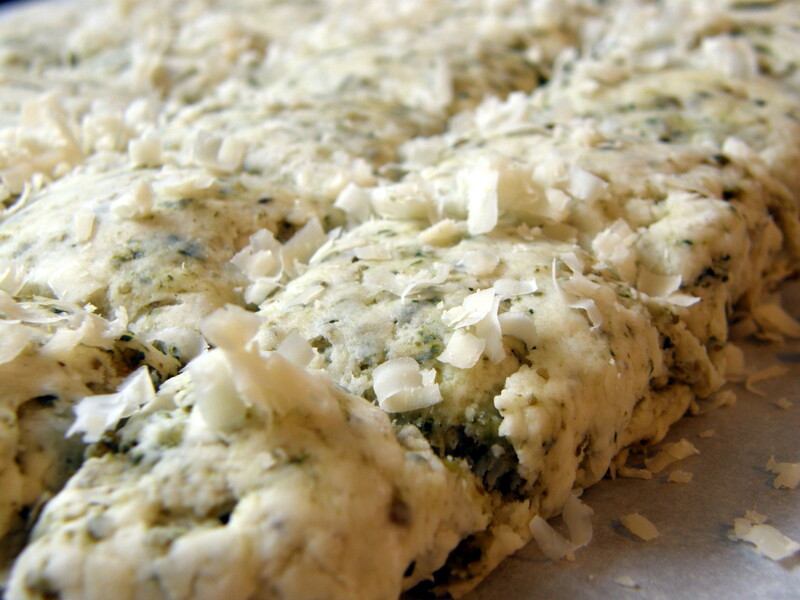 Using a pastry scraper, knife, spatula or other edge, cut dough into squares about 1 1/2 inches across. You do not need to move the dough after cutting. 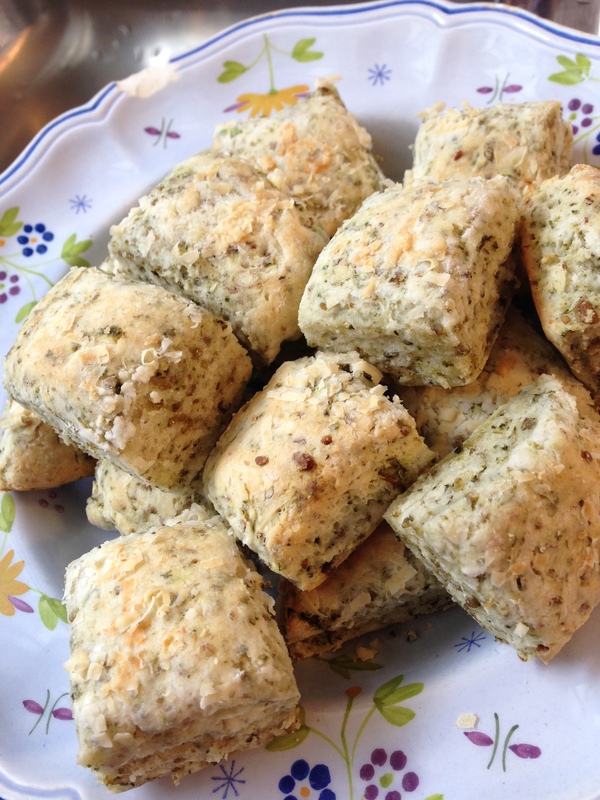 Sprinkle tops of biscuits with shredded parmesan and a little more pepper if you like. 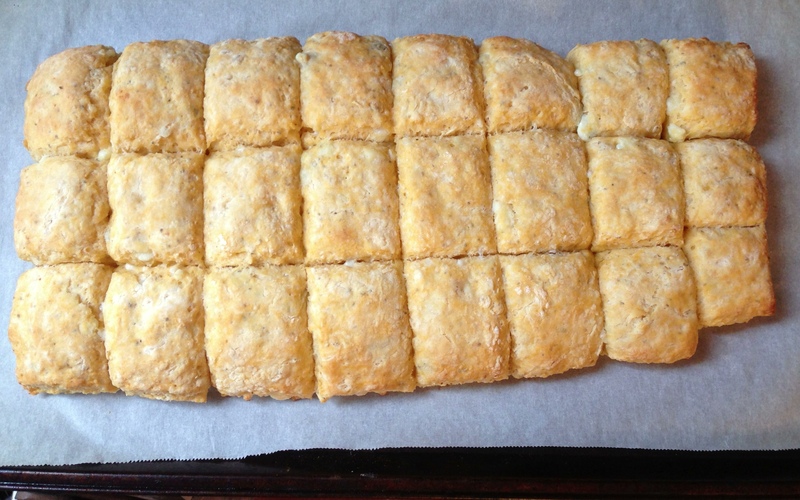 Put cookie sheet in oven and bake for 12-15 minutes, until tops of biscuits are slightly browned.